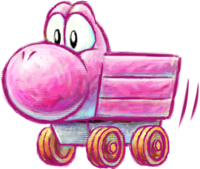 Mine-Cart Yoshi (parsed Mine Cart Yoshi in PAL regions; also simply known as the Mine Cart) is a form the Yoshis can assume in Yoshi's New Island by entering a Whirly Gate with a minecart sign on it. While Yoshi is in this form, the player can tilt the Nintendo 3DS system to move him left and right and press any button to make him jump. Yoshi cannot attack enemies in this form, and will be stunned for a brief moment when he touches one. Like all forms, Yoshi only has a limited amount of time before he reverts to normal and is sent back to the Whirly Gate entrance; clocks scattered about the obstacle course provide the Yoshi with more time. Going through a ring will simply return the Yoshi to normal. Mine-Cart Yoshi appears on a LV 2 Battle Card in Mario & Luigi: Paper Jam. When used, the card enables the player to earn Star Points in accordance to the damage taken in battle. This page was last edited on February 4, 2019, at 22:07.